Can you believe this !! These guys are actually charging $25 for this piece of software which gets all the features of Windows classic Start menu back into Windows 7! . 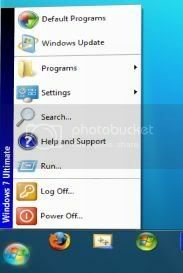 Called as Seven Classic Start, it returns the "convenience" of Windows original Start menu to Windows 7 users, making the new system easier to master for users of Windows XP and Vista. Probably for guys who find it difficult to get used to new things easily. Dont know how many will actually go for it, however! The classic menu was one of the several features dropped in Windows 7. Wow...! he deserve to get 25$ for it. There are lots of users, who are not happy with Windows modern start menu since Windows XP.